Singer and songwriter Tom Petty performs during the half time show of the NFL's Super Bowl XLII football game between the New England Patriots and the New York Giants in Glendale, Arizona, Feb. 3, 2008. Tom Petty, a singer and guitarist who burst onto the scene in 1970s as one of the most original, searching voices in rock and remained a major hitmaker for four decades, writing songs including “Free Fallin’,” “I Won’t Back Down” and “American Girl,” died Oct. 2 at a hospital in Santa Monica, California. He was 66. 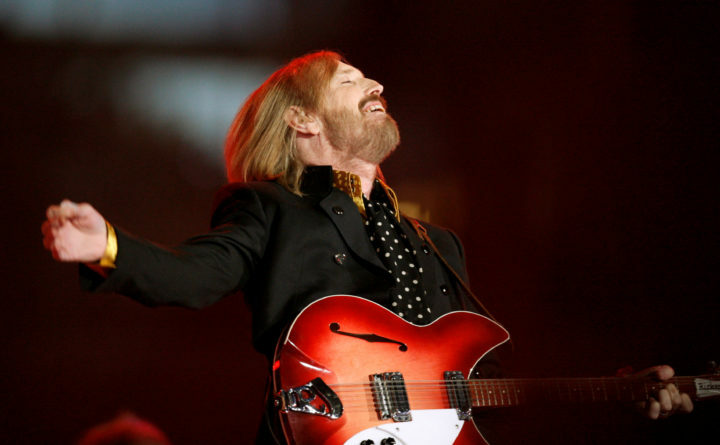 Petty’s death was confirmed by Tony Dimitriades, longtime manager of Tom Petty & The Heartbreakers, on behalf of the family. Petty and his band, the Heartbreakers, released their self-titled debut in 1976 and soon drew comparisons to the bluesy, guitar-heavy rock of the Rolling Stones and the Byrds. Their music was unabashedly sentimental, seeming to speak to striving, everyday Americans no less than the songs of fellow rocker Bruce Springsteen, while featuring clever arrangements that intertwined the fretwork of Petty and lead guitarist Mike Campbell. The group toured seemingly nonstop for decades, leading boisterous shows as recently as last week, when Petty concluded a nationwide tour that he said may well be his last. “I don’t want to spend my life on the road,” he told Rolling Stone. It was simple, straightforward and catchy, with a hummable hook that helped Petty’s solo debut, “Full Moon Fever” (1989), sell millions of copies. His “Greatest Hits” record, a compilation that included the harmonica-driven single “Mary Jane’s Last Dance,” fared even better, sitting on the Top 200 albums chart for more than six years and briefly staking a claim to one of the 100 best-selling albums of all time. Petty’s career was marked by personal problems that included a heroin addiction, a tumultuous marriage and a 1987 house fire that burned everything but his basement recording studio. But he remained one of the most durable and distinctive presences in rock for decades, sporting a nasal voice and blond hair that fell to his shoulders. His 1980s music videos, including an “Alice in Wonderland”-inspired video for “Don’t Come Around Here No More” (1985), in which Petty played a sunglasses-wearing Mad Hatter, introduced him to some members of the MTV generation. And his recordings with the Traveling Wilburys, a supergroup formed in 1988 with Bob Dylan, George Harrison of the Beatles and Roy Orbison (who died later that year), connected him with an earlier era of rock music. Thomas Earl Petty was born in Gainesville on Oct. 20, 1950, the son of an alcoholic insurance salesman who beat him relentlessly from the time he was 5. His body, he later said, was covered in welts. His revenge was a slingshot to the fin of his father’s 1955 Cadillac. He escaped the pain of his family life through watching television and then through music. An encounter with rock star Elvis Presley, who was in town to shoot a scene from the 1962 Hollywood musical “Follow That Dream,” was a defining moment of his childhood. Through family connections — an uncle who had been hired to assist the film crew — he managed to get onto the film set and meet the star. He soon became obsessed with the guitar, the instrument of his musical idol, and his school grades began to drop. He said he preferred the company of his guitar to dates and other teenage rites of passage, and as the Beatles invaded the pop charts his hair grew in length. Mudcrutch had a strong following in Florida, but Petty said he was determined to cast a wider mark, which meant writing his own music and hoping it would catch the attention of a record company in Los Angeles. They signed with Shelter Records, but the band broke up over artistic and personal clashes. “We did the L.A. freakout,” Petty later quipped. Not until 1975, at a demo session that included Tench, Campbell, drummer Stan Lynch and bassist Ron Blair, did Petty suddenly find the chemistry just right. Calling themselves Tom Petty and the Heartbreakers, they released two major hits the next year, “American Girl” and “Breakdown,” which vaulted them to national attention and a regular spot performing at the Whiskey a Go Go and other major Los Angeles clubs. Their style was a throwback in many ways, a rejection of arena rock bands like Led Zeppelin and the blues roots music of the Allman Brothers in favor of the feral sound of early Presley and Buddy Holly. When promoters and radio stations classified the group as a punk act, Petty fumed. He and his band were pure rockers. Legal entanglements ensued when his record company changed hands after the release of the band’s second album, “You’re Gonna Get It!” in 1978. Petty said he refused to be “bought and sold like a piece of meat,” and found his career stalled over charges of breach of contract when he wanted out. He declared bankruptcy in 1979, signed with a new label, Backstreet Records, and reached a settlement with his former record company. The new arrangement would mark a renaissance in Petty’s music. The record “Damn the Torpedoes” (1979) — a playful jab at his legal troubles — endures as one of the timeless rock albums of the era, oozing tenderness and toughness and a propulsive rock drive on songs such as “Refugee” and “Louisiana Rain.” The album, defined by Petty’s emotive vocals and Campbell’s vital guitarwork, sold millions of copies and summited the pop charts. Petty’s next several albums with the Heartbreakers — including “Hard Promises” (1981), with a duet with Stevie Nicks of Fleetwood Mac on the song “Insider,” and “Long After Dark” (1982) — continued to sell exceedingly well. Critics rhapsodized on his originality and suppleness. In 1986, he and the Heartbreakers toured as the backing band for Dylan, one of Petty’s chief musical influences. Their next album, “Let Me Up (I’ve Had Enough)” in 1987, demonstrated a shaggy freewheeling spirit more than their previous polished studio work and a virtuoso-like versatility, but he also saw his commercial prospects dwindling. His work with the Traveling Wilburys, and the chart-topping success of “Free Fallin’” and “I Won’t Back Down,” from “Full Moon Fever,” propelled him into the next decade. As Petty put it, the album “made me such a nice guy for about a year.” He was now a household name, an arena-filling act who suddenly became a target for music critics anticipating that he — now on the precipice of fame — would relinquish his mantle as an innovator and leave behind his roots in favor of lucre. His later albums, among them “Into the Great Wide Open” and “Wildflowers,” continued to reap financial rewards for its creator, but he remained very much attuned to musical integrity. His music lacked superstar pretensions in favor of exquisite melodies and high-level craftsmanship. He tried to avoid the pitfalls of 1980s rock-band excess, and he embraced the hallmarks of the post-Nirvana generation of music makers. His marriage to Jane Benyo, with whom he had two daughters, ended in divorce; he said her escalating drug use and mental illness, including threats of suicide, exacerbated his own prodigious heroin consumption and a furtive public posture. In 2001, he married Dana York in a ceremony presided over by rock star and ordained minister Little Richard. A complete list of survivors could not be immediately confirmed.